Booker Prize winning author Hilary Mantel has received a body blow of media vilification. It’s all because of a Hilary Mantel speech that she’s given. The speech in question is nearly two weeks old. Not that current at all. She gave her speech, called Royal Bodies, on 4th February at a British Museum event organised by the London Review of Books. Quite why it’s taken the Daily Mail so long to read and comment on the speech is anyone’s guess. But, one thing is for certain. Hilary Mantel’s speech does not savage the Royal family. It’s neither astonishing nor venomous. Her speech brought history, Mantel’s imagination and the span of history right up to the present day. Superb. One clue comes in the form of Hilary’s introduction to the event. Her introduction took five minutes. Five whole minutes. That’s the length of some people’s speeches! The London Review of Books event was essentially a bookish and academic event; clever, erudite and intellectual. Neither vindictive nor vicious. Humour mixed with stories as Mantel progressed through her modern critique of monarchy and their bodies. This was a take on history that has to be listened to. Our current royal family doesn’t have the difficulties in breeding that pandas do, but pandas and royal persons alike are expensive to conserve and ill-adapted to any modern environment. But aren’t they interesting? Aren’t they nice to look at? Mantel’s speech was far longer than her five minute introduction. A whole hour of discourse for he appreciative audience. The monarchy is her specialist subject and for that we can be thankful. The rich span of history evident in her speech does include the current generation…and that can’t be ignored. But, for all its length, the speech wasn’t tiring. This was excellent prose containing some superb writing, delightful stories and descriptions. And I felt sorry then. I wanted to apologise. I wanted to say: it’s nothing personal, it’s monarchy I’m staring at. I rejoined, mentally, the rest of the guests. Now flunkeys were moving among us with trays and on them were canapés, and these snacks were the queen’s revenge. They were pieces of gristly meat on skewers. Let’s not put too fine a point on it: they were kebabs. It took some time to chew through one of them, and then the guests were left with the little sticks in their hands. They tried to give them back to the flunkeys, but the flunkeys smiled and sadly shook their heads, and moved away, so the guests had to carry on the evening holding them out, like children with sparklers on Guy Fawkes night. Her audience appreciated her speech. There’s no denying that. So she included some humour and also an element of self-deprecation within her speech. Yes, she mentioned Catherine Middleton, but not her Royal speeches. Therefore her speech also discussed just about every other Royal body you can care to think of from the Tudor period–and plenty of others. 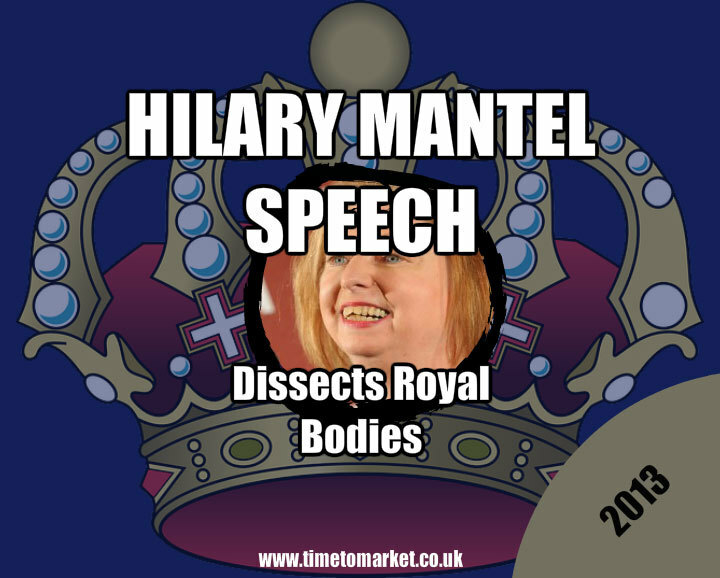 Did Hilary Mantel achieve her objectives for this speech? I think so. 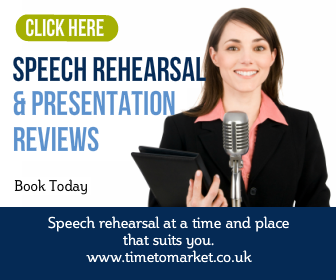 You too can achieve your public speaking objectives with public speaking skills training or coaching. 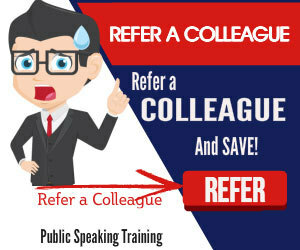 That’s because a well-timed training session will always sharpen your confidence and public speaking skills. Please don’t hesitate to get in touch when the time is right.